Back in January of this year we had the great pleasure of meeting Mr. Ryan Burke from 60 Cycle Hum: The Guitar Podcast on the NAMM Show floor. He quickly filled us in on his eternal quest for a reverb pedal that truly captures the elusive "drip" of a vintage Fender 6G15 outboard spring reverb tank. "I am always chasing the drippy dragon," he confided. Just moments before Ryan had received word from a fellow surf guitarist that Source Audio was showing the new Outboard Spring engine for the Ventris Dual Reverb and that he needed to check it out. For those of you new to the game, drippy spring reverb is THE sound for surf rock guitarists of every generation. The trouble is that it's very, very difficult to capture the sound of a bulky outboard spring tank in a compact effects pedal. Many pedal companies have tried - some use a triggered audio sample in an effort to capture the drip. The problem with this approach is that you are not actually hearing a reaction to the note being played or the velocity of the picking. It's the same audio sample repeated over and over again with each pick attack. The Ventris does not use triggered audio - the drip you hear is a genuine reaction to the incoming signal. Ryan, a true connoisseur of surf rock tones, is exactly the type of musician we aimed to convince with the Outboard Spring engine. According to his recount of that initial encounter, he played one note through the Ventris's Outboard Spring engine and concluded, "They've freakin' done it. It drips!!!" 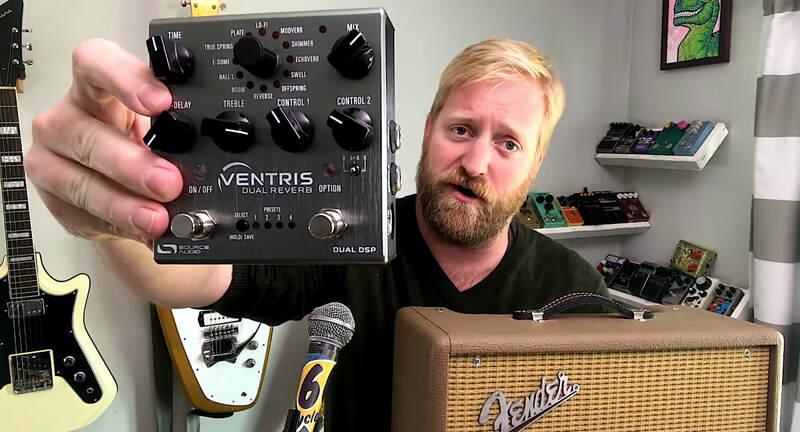 A few weeks later Ryan got his hands on a Ventris and produced the following video. It's a head-to-head blind listening test between a real Fender spring reverb tank and the Ventris Outboard Spring engine. Can you tell which is which? ​By the way, if you want to find out which is the Fender and which is Ventris, keep an eye on the 60 Cycle Hum Youtube channel. We highly recommend Ryan's channel, he specializes in effects pedals (primarily reverb effects) and low cost guitars - it is a lot of fun and very informative. But what is spring reverb drip? Basically, it’s the sound that spring reverb tanks make when reacting to the initial attack of an incoming guitar signal. Imagine a drop of water falling into a partially filled metal bucket. Maybe that bucket is sitting in a bathroom with highly reflective porcelain tiles – are you starting to understand how the drip might sound? What you are actually hearing is a physical occurrence known as “high frequency dispersion,” whereby higher frequencies take significantly longer to pass through a solid object (the springs) than the lower frequencies. It is this divergence in frequency travel time that really causes the audio phenomenon we call “drip.” Now if you really, really want that extreme drip, it is far less prevalent in amps with a built-in spring reverb,. What you need is an outboard spring tank like the classic Fender 6G15 – this piece of gear is king in the surf rock world. ​Below is a prime example of a drippy spring reverb, The Chantays' Pipeline. The drippy ghost notes in the reverb reflections are most noticeable in those tight, palm muted notes on the low E string and that rapid-fire dive-bomb (Please note: killer choreographed dance steps are not an essential element to achieving reverb drip). ​So how does the Ventris do it? Well as Bob Chidlaw (Source Audio’s Chief Scientist) likes to say, “If we told you, we’d have to kill you.” Yeah, it's kind of a secret, it really comes down to the exceptional Source Audio engineering team of Bob Chidlaw and Jesse Remignanti and the Ventris Dual Reverb’s dual processing muscle. Source Audio President, Roger Smith noted, “dual processing eliminates bloated all-in-one reverb programs. Instead of being forced to allocate 5% of the processing power to something vital and complex like the Spring reverb, we can now dedicate 100% of the processor, opening the door to a new frontier of sonic realism.” Check out this interview with Bob where he talks about the work involved in capturing the sound of vintage spring reverb tanks. If you want to try the Outboard Spring engine, it is available with the Neuro Desktop Editor. The Neuro Desktop Editor is a free download for Mac or Windows based PCs and is available on the Source Audio Downloads page in the Software tab. Check out our Neuro/Ventris blog for instructions on downloading the Outboard Spring and creating other highly customized presets for your Ventris Dual Reverb.